So, if you are an avid reader of the European Journal of Higher Education – and I have no doubt that if you aren’t now, you will be soon – you will find my article in issue 4 in the “Debate” section. Sabzalieva, Emma. 2017. “The Policy Challenges of Creating a World-Class University Outside the Global ‘core.’” European Journal of Higher Education 7 (4):424–39. https://doi.org/10.1080/21568235.2017.1292856. the globe, also gaining traction in states outside the global ‘core’. as a means of fulfilling domestic nation-building objectives. interpretations of what it means to be a world-class university. Would you like a free copy of the article? There are 50 e-copies up for grabs at http://www.tandfonline.com/eprint/BugJKtrEFRnhfJpkeDya/full. Go ahead, be my guest! I’d love to know what you think of the article. Questions, comments and suggestions for improvement are all welcomed. This entry was posted in Kazakhstan and tagged core, Higher education in Central Asia, Kazakhstan, Nazarbayev University, periphery, public policy, World-class university. I’m pleased to report that my article ‘Challenges in contemporary higher education in Kyrgyzstan, Central Asia’ has been accepted for publication in the peer-reviewed journal Perspectives: policy and practice in higher education! The article builds on the interviews I undertook in summer 2014 with senior university managers in Bishkek, Kyrgyzstan, thanks to funding from the Joan Balchin Memorial Fund. This entry was posted in Kyrgyzstan, Uncategorized and tagged Central Asia, globalization of higher education, Higher education, Higher education in Central Asia, Kyrgyzstan. Generating more productive employment is arguably the most critical challenge [for the government, against a backdrop of relative political and economic stability]. This finding comes from an extensive household survey undertaken in Tajikistan that focussed on skills, the first of its kind. There are some interesting sections in the report explaining why this skills approach was taken and just how you go about measuring and comparing cognitive skills such as working memory and graph comprehension. The strong conclusion of the report is that there are serious skills gaps in Tajikistan. Both the causes and the impact of these gaps are multifarious. As an example, the authors identify points throughout the life course where opportunities to enhance skills are currently being missed. During the early years of life, access to pre-school or equivalent early years education is not available to enough children. Once people have left education (and women are leaving education significantly earlier than their male counterparts), difficulties in finding work and a paucity of work-based training are contributing to a growing mis-match between the skills employers are increasingly demanding and the experiences that employees are able or willing to offer. This is a richly detailed report that makes use of some very valuable new primary data, and is well worth reading. This brief summary should hopefully whet your appetite! for employability in Tajikistan. World Bank, Washington, USA. Available at http://eprints.lse.ac.uk/60024/1/__lse.ac.uk_storage_LIBRARY_Secondary_libfile_shared_repository_Content_Nikoloski%2C%20Z_Nikoloski_Skills_Road_Tajikistan_Nikoloski_Skills_%20Road_Tajikistan_2014.pdf. This entry was posted in Tajikistan, Uncategorized and tagged employment, Higher education in Central Asia, skills, skills deficit, Tajikistan. So says their Tajikistan country project manager Patricia Veevers-Carter. The purpose of the project was to introduce a standard university admissions test in Tajikistan, along the lines used by other countries and introduced in neighbouring Kyrgyzstan in 2002. The admissions test is part of the remit of the National Testing Centre (NTC) established by the Tajik government in 2008. The NTC intends to undertake other assessments to inform educational policy and contribute towards the improved education that the World Bank underlines as being of such critical importance to the country’s development. The early results are impressive: a 30% increase in the number taking the admissions test between 2013 and 2014. That figure masks a poor female participation rate at only 33% of the total number, which, sadly, is in keeping with the current enrolment breakdown by gender. eliminate corruption and nepotism from post-Soviet Kyrgyzstan’s education system’ (Smith, 2012), moving away from the informal practice of either paying under the table for admission or getting in because someone you know is able to negotiate a place for you. So there may be lessons for Tajikistan to learn from the Kyrgyz experience, but there is still a long way to go before improvements to higher education in Tajikistan become fundamentally embedded. Starting with admissions, reforms are needed throughout the student journey, from funding to corruption to post-study employment. This entry was posted in Kyrgyzstan, Tajikistan, Uncategorized and tagged Higher education in Central Asia, higher education reform, Kyrgyzstan, Tajikistan, university admissions test, World Bank. This summer I spent nearly a month in Bishkek, capital of Kyrgyzstan, both on holiday and also doing some research on university administration and management in Central Asian universities. 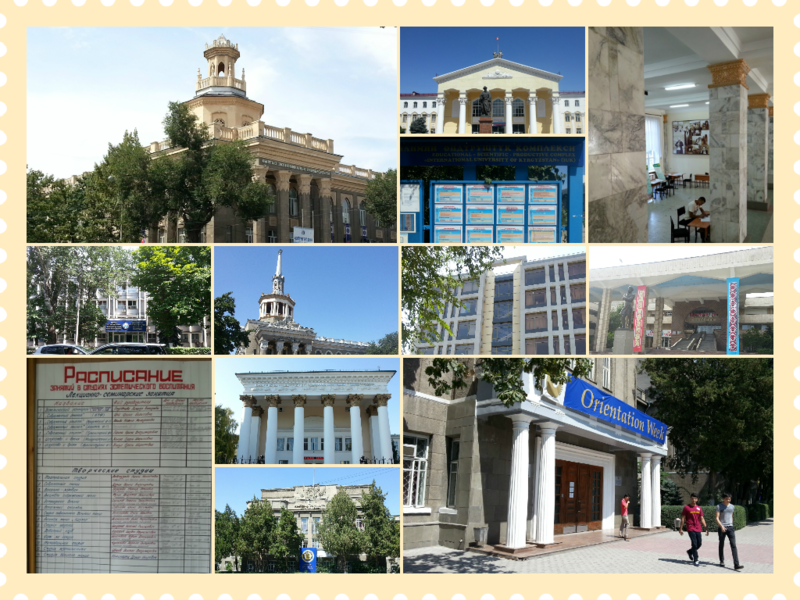 More on the latter in a future post but in the meantime, today’s post is a “postcard” from me highlighting just a handful of Bishkek’s many higher education institutions. A snapshot of some universities in Bishkek. Top row (L-R): Kyrgyz Economic University, Kyrgyz National University, a noticeboard with course descriptions offered by the Kyrgyz International University (underneath International University), a student completing registration at the Agrarian University. Middle row (L-R): the partially tree-hidden Ministry of Education and Science, view of the top of Kyrgyz International University, University of Central Asia’s central administration office, Russian-Kyrgyz Slavonic University. Bottom row (L-R): Handwritten timetable of classes at Russian-Kyrgyz Slavonic University, Kyrgyz National University, American University of Central Asia (underneath National University), students outside American University of Central Asia during Orientation Week. This entry was posted in Kyrgyzstan, Uncategorized and tagged Higher education in Central Asia, Kyrgyzstan.